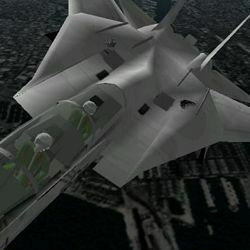 Comments - Chapter 4 of one a successful combat flight sim series which began with F/A-18 Interceptor on the Commodore Amiga.
" 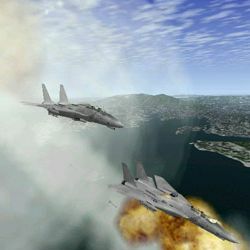 JetFighter 4 will have a great set of scenery that is entirely "textured" with aerial photos of part of California draped across real elevation data at a higher resolution than Jetfighter III. Where Jetfighter 3 had 14,400 elevations in a particular area there will be 65, 536 elevations. This really adds to the detail of the terrain. Also, there are lots of custom designed models in the San Francisco area as well as all the automatically added features like power lines that run where they should. " " Four times the terrain detail of JetFighter III - the best looking combat flight sim now looks even better! The photorealistic scenery is positively breathtaking - with simulated topography across the San Francisco geography! The Golden Gate bridge has never looked better - from 300 or 30,000 feet from the deck. "